Adding to the rapidly expanding amount of high-end NBA card options, 2014-15 Panini Luxe Basketball is a new creation that focuses on hits that are all numbered to 99 or less. Metal-framed cards set the product apart from the other premium Panini releases. Each one-pack box yields three on-card autographs and one jumbo memorabilia card and covers top rookies, current stars and former greats. 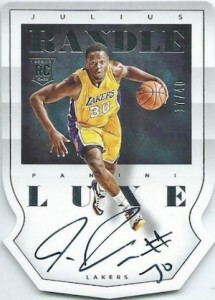 Luxe Autographs are the featured option in 2014-15 Panini Luxe Basketball and stand out thanks to a metal design. 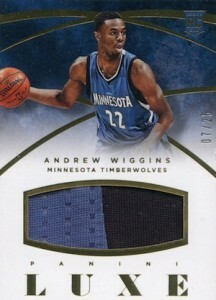 The cards are especially notable because they are the first metal-bordered cards in Panini's history. Signed on-card in white ink, Luxe Autographs also feature a variety of parallels with different foil colors. 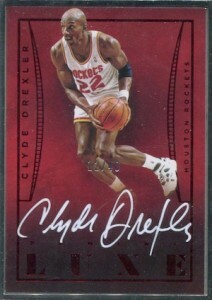 Die-Cut Autographs are a more traditional signed card, but with a unique shape. Memorabilia Autographs are signed on-card and add a large jersey swatch. A Prime parallel is available with a print run of 25 copies or less. Lastly, collectors can find one jumbo prime relic card per box. Memorabilia Die-Cuts Prime promise premium jersey pieces and can be found in several parallels, including Red, Blue, Gold and Black. 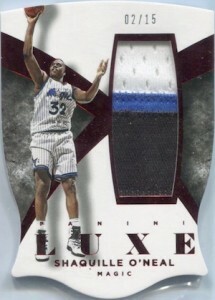 Luxe Memorabilia Prime offers a similar concept, but without the die-cut design. 2014-15 LUXE BERNARD KING GOLD FRAME AUTO #D 10 RARE AUTOGRAPH ON CARD HOF ? View the full spreadsheet for specific parallel print runs. Above underscores an issue that CC must address; The rating of products that have yet to be released. I’m very certain that JP meant well, but submitting a “POOR” rating on a product nearly 3 months prior to release does everyone a disservice. Cardboard Connection, for me and many other collectors, operates as a barometer of sorts. How is the community receiving a given product, and at what price are singles and boxes changing hands throughout the secondary market. While Luxe may not be for everyone, the admittedly few breaks I have seen appear to offer collectors a pretty interesting product and array of auto mem’. The jumbo patches autos are particularly sharp.